Edinburgh Trams exceeded all financial expectations in 2017, recording a pre-tax profit of £1.6 million compared to £252,000 in 2016. Results published on Friday show revenue grew 24% to £13 million in 2017 from £10.3 million in 2016. Costs rose from £10 million to £11.4 million. The figures exceed forecasts in the City of Edinburgh Council’s original business model which predicted a profit of £333,000 for 2017. Total number of customer journeys rose 19% to 6.7 million. The trams recorded their highest ever usage in one day with 42,000 customer journeys recorded on June 9, 2017, the day of a Robbie Williams concert at BT Murrayfield. Edinburgh Trams’ managing director Lea Harrison said: “In 2016 we returned our first operating profit a year ahead of schedule and, in 2017, financial performance has continued to exceed expectations. “The introduction of a new timetable at the start of the year played a major part in this success, with a 23% increase in services encouraging more people to take the tram when visiting the city for business or pleasure. “We’ve also worked hard to reduce journey times, with a trip between Edinburgh Airport and the city centre taking less than 35 minutes. “Alongside these operational improvements we’ve continued our commitment to providing the best possible service to our customers, rolling out a series of successful initiatives. “These include the introduction of a contactless payment system and running additional trams when the city hosts major events. 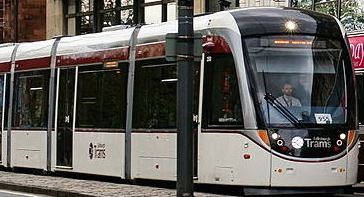 “This passenger-focussed approach has seen Edinburgh Trams named as Operator of the Year at the prestigious Global Light Rail Awards and receive numerous accolades for excellence in customer service. Transport for Edinburgh CEO George Lowder said: “These are fantastic results for the tram operator and help demonstrate why the City’s tramway plays a vital part in Edinburgh’s integrated transport network.